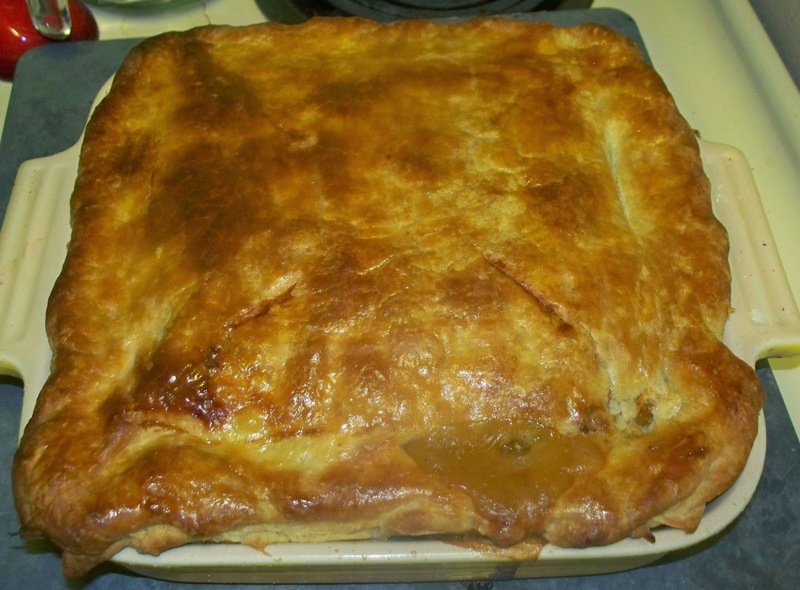 I like me some good potpie, and this recipe made some good potpie. There was a small issue of taking about 4 hours to make. I also had a small issue with having about double the quantity of filling as my potpie could hold. Whisk together the flour, salt, and sugar in a bowl. Using a pastry blade cut the butter into the four mixture until it looks like a coarse meal. Add 1/4 cup of ice water 1 Tbsp at a time until the dough just holds together, mixing with a fork as you do so. Divide the dough into 2 equal sized balls, wrap them in plastic wrap and place them in your refrigerator. In a bowl, mix the onion, carrots, and leek with the EVOO. Put the veggies on a foil-lined baking sheet and bake for 30 minutes. Put the now cooked veggies in a Dutch oven along with the chicken, celery, thyme, white wine, salt, and peppercorns. Add 8 cups of water and bring to a boil over high heat. Reduce the heat to low, cover, and cook for an hour. Remove the chicken from the pot and set aside until cool. Strain the broth and discard the solids. The carrots are actually quite yummy, if you like mushy carrots, and make a great snack. Stir the tomato paste into the remaining broth and cook over medium heat for about 40 minutes. When the chicken is cool enough to handle, remove the meat from the bones and shred the meat. Or if you were like me and used skinless, boneless, breasts then just shred it. Add the carrots and onions and cook until they begin to soften. This is about 8 minutes. Add the pees, salt, and pepper and cook for another 2 minutes. Using the same skillet, melt the butter, but this time lower the heat to medium. Whisk in the four and cook for about 10 minutes. You are going to want to whisk constantly at this step. Whisk in thyme, rosemary, shredded chicken, vegetables, and broth. Cook for another 10ish minutes. While cooking remove the dough from the refrigerator. On a lightly floured surface flatten a dough ball with a rolling pin. Roll it out so that the crust will fit easily into a 9 or 10 inch pie pan with a little left over. This is about 14 inches across. Transfer the crust from the counter to the pie pan. Transfer the filling into the crust. If you are like me you will end up with a lot of extra filling. I just kept it warm and served it on the side with the potpie later as I like me some filling, and big pot pies sort of fall apart if you serve them when they are fresh from the oven (so no one could really tell that I added extra). Roll out the other dough ball into a 13 inch round. Make sure that your flowered surface is still flowered when doing this. Transfer the second crust on top of the filling. Cut off most of the excess crust around the outside of the pie pan leaving about 1/2 an inch of excess to make the crust edge. Roll under the excess crust and crimp with your fingers. Cut a couple of slits in the top crust, and place the pot pie on a baking sheet. 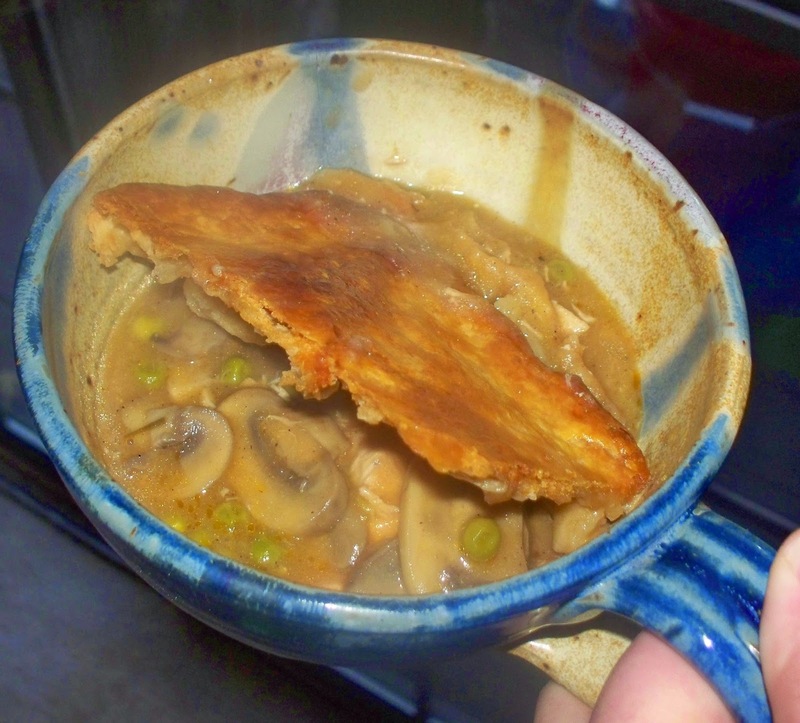 Put the potpie in the oven for 45 minutes. Remove the potpie to a wire rack and let sit for at least 5 minutes. And that in a nutshell is how to make a very yummy potpie. The day I made it I was in the kitchen for 5 hours, but I did make an apple crisp as well so if this is all you make, it probably will not take you that long.